Whether you’ve made it into first caps as a Copywriter or you are a talented newbie just starting out, there’s a workshop for people like you. Possibly Dublin’s first. 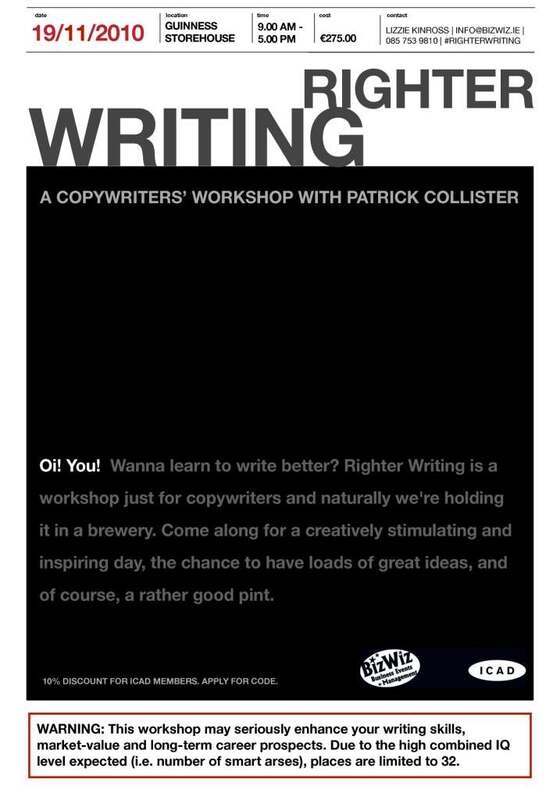 Come along to ‘Righter Writing’ with Patrick Collister, a workshop just for copywriters. Patrick’s not just a major advertising head (think 7 years as Executive Creative Director at Ogilvy & Mather, think Gold at Cannes, etc.) he’s a inspiring and motivating trainer too. You’ll come away fired up by dozens of examples of genius word-smithery, with loads of easy-to-use practical tools, creative exercises and techniques. With 32 copywriters in one room, there’ll be sparks flying. We might even come up with something amazing. Just in case, we’ll have a live brief from the Dublin Simon Community to work on during the day. If it’s your idea, and they want to pursue it, it’s still your idea. You might decide to give it to them. But then again, you might not! The important thing is having brilliant ideas. We are now offering a 10% discount for ICAD members, and we have got 6 student places available at half price. So, if you’re studying to be a writer, or you’re a member of ICAD, contact contact liz@bizwiz.ie for the relevant promotional code before completing your booking online. This entry was posted in Flyer. Bookmark the permalink.